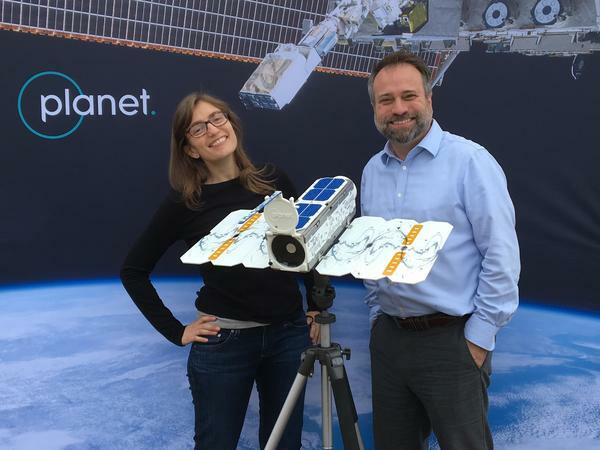 Planet in San Francisco has agreed to send up a satellite with our logo on it and take some pictures for us. In a way, we're in the spying game now. Back in the 60s, satellites would take photographs from space and then send the film canisters back to earth--literally drop them into the atmosphere, where they were caught in a net attached to an airplane. There was only a limited number of pictures you could get that way. And they still took a ton of time to analyze. Now, digital images are beamed back to earth in such high quantity and with such high speed that the government has no choice but to teach computers to analyze them. Even tiny Planet announced on November 9th that they'd reached their goal of photographing the world's landmass every single day. A company called Genscape uses satellites to take photos that contain "market intelligence:" information that their clients can use in business. Genscape's images monitor the progress of oil wells being drilled in South Sudan, or a pipeline being built across Ohio. On today's show, what can Planet Money's satellite show to give us an edge in business? Robert hits upon an idea that could provide important intelligence to the American public. Music: "Blue Eyes" and "Through the Looking Glass." Find us: Twitter/ Facebook.